I had the most delectable dessert the other night. 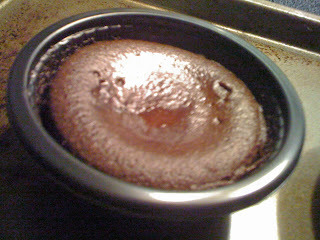 (a little indulgence is good every once in awhile, right) Quite possibly one of the best desserts I've ever had - a Trader Joe's Chocolate Lava Cake. Obviously, this isn't "health food" nor is it vegan, but it sure was delicious. The outside of the cake was warm and moist and the center was like chocolate lava - liquidy, rich (but not too rich), and delicious. When I purchased these cakes at Trader Joe's, my cashier told me how good these cakes are, but I never could have imagined how good they'd really be. I'm normally not even that big of a cake fan, but I almost wanted to lick the little plastic bowl clean. I can honestly say this is one of the best grocery store dessert purchases I've ever made. It even beats most of the fancy schmantzy desserts I've had at restaurants. There are cooking directions for the microwave or a traditional oven, so gluttony can be just minutes away! If you're having a bad day or are just looking for an uber rich chocolaty treat, you have to give this cake a try.